The coldest weather by far belonged to Northern Illinois. This may not sound like such a surprise, as this is the coldest spot in the Midwest climatologically. However, the region reached record-breaking cold in November 2017. The date in question was the 10th, as high pressure glided past the northern plains and into the Great Lakes region. This high came with a bitter blast of Arctic air, bringing low temperatures down into the teens across this area. Rockford came in with a low of 14 degrees, just squeaking past the previous record of 15 set in 1973. Meanwhile, it was a tie for O’Hare, matching 1986’s minimum of 18 degrees. Official low at O'Hare was 18°. This helped to also set the stage for a rare Lake Michigan-induced snow event that November 10th morning. With lake surface temperatures safely in the 50s and the densely cold airmass in place, the result was highly favorable conditions in place for snow development. The only other ingredient that was needed was an easterly wind. At first, the night started with the northerly winds that advected in the cold air. As the high moved east, the wind direction responded with a clockwise turn to the east. The very cold air and warm lake made conditions highly unstable, enough to rapidly build a band of snow on the eastern side of the lake. The wind shift gradually helped to push this snow to the lake shore as the morning wore on, with even some periods of moderate to heavy snow being picked up along immediate lake shore locations. Thanks to that bitter cold, the snow was able to stick quickly to roads, creating traffic headaches for the Chicago Metro area. It was not all about cold weather, however, as there was some severe weather and record warmth that highlighted the month as well. 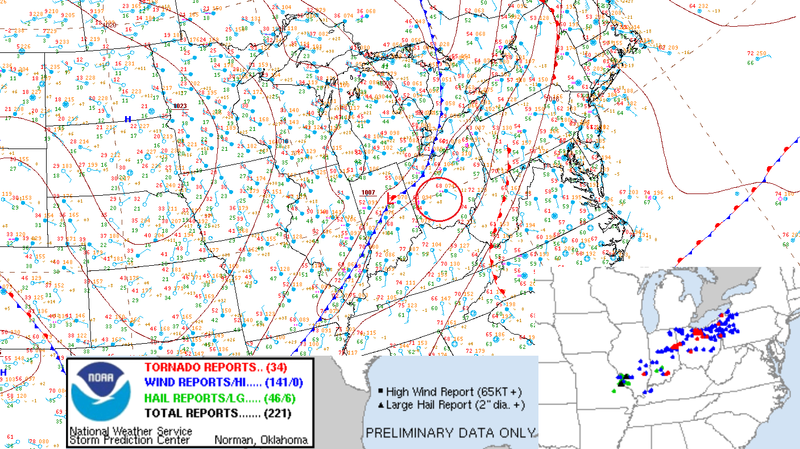 The severe-weather standout came courtesy of a strong cold front impacting the Ohio Valley on the 5th. The stage was set during the daytime hours, with temperatures that soared into the lower and middle 70s. This warmth, along with low pressure riding along the boundary, helped bolster a volatile atmosphere that produced several tornadoes over Indiana and Ohio. It was a particularly close call for Dayton and Columbus, with an observed EF-1 tornado captured in nearby Clark County. This same disturbance resulted in record rainfall in these major Ohio cities on the 5th, with the higher total in Dayton of 3.57” besting the previous high mark 2.18” in 1948. Relatively speaking, the end of November proved to be mild in the Midwest, especially over Rockford and O’Hare. Both cities finished with high temperatures that averaged around 13 degrees above normal for the final 7 days of November, 3rd warmest on record for this stretch of days. It was highlighted by a tie for a record high temperature of 65 degrees set at Rockford on the 24th, matching the previous record in 1931. The final month of the year 2017 was a volatile one in terms of temperature with glaring ups and downs throughout. It also came with numerous snow events, but overall below-normal snowfall and precipitation. 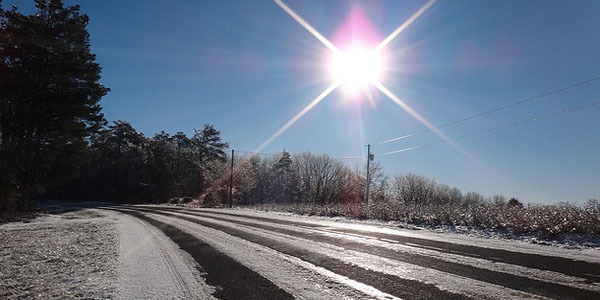 What proved to be the most significant aspect of the month, however, was the arctic blast that ultimately finished off the year and even brought a white Christmas. Considering just how cold the month finished off, it is easy to forget that there were mild stretches as well. The first 4 or 5 days really stood out in this respect, with daily highs in the 50s and 60s across the entire Midwest. It was a mild enough pattern to even bring a near-miss from severe weather on the 4th with a cold front passing well to the southwest of Chicago. This same system swept through the rest of the Midwest into the 5th, bringing the first dip in the roller coaster ride of temperatures, with 30s and 40s into the second week of December. One more reprieve followed into the 16th as another ridge built back into the eastern half of the U.S, but it would ultimately be the year’s final mild stretch. With all of the warm weather experienced in the middle of the month, it certainly did not feel like Christmas was approaching. Mother Nature eventually flipped the script, however, as the chilly conditions arrived for the Christmas holiday. A 20 or so degree drop in temperature was felt by all across the Midwest, with Chicago falling from the 40s into the 20s and Indianapolis and Ohio tumbling from the 50s into the lower 30s. To add to the festive nature of the holiday, it also came with snow. Surface map of 6AM CST on 12/23/2017. A cold front separates arctic air to the NW from marginally cool temperatures to the east. While not a major accumulating snow, the clipper that developed over the area produced enough snowfall to bring a white Christmas to all. Widespread accumulating snows do not come around all that often on Christmas Eve, even in the Midwest, so the minor totals seen across the region were enough to finish toward the top of the record list. The Chicago metro finished with the highest totals in the 2 to 3 inch range. Meanwhile, Indianapolis and southwest/central Ohio, picked up a respectable 1-2” snowfall to set up the winter wonderland. It was a cold holiday week spanning from Christmas Day through New Year’s Eve. In fact, it was near-record cold for many, and even record-breaking for some. Rockford stood out as one of the record breakers, as a teeth-chattering mean temperature of 3.5 degrees broke the previous record of 4.6 degrees set in the infamous 1983 arctic stretch. For perspective, the normal average for this stretch is 22.4° for the city, a significant departure of 18.9 below. All other cities fell just short of 1983’s event, with average temperatures for the period finishing in 2nd place overall. While this stretch of cold was impressive, the year finished much warmer than normal overall. Rockford’s mean temperature finished two degrees above normal at 51.2°. This may not sound significant, but in terms of the overall rankings, it certainly was, topping out at 4th warmest on record. Meanwhile, the 52.6° at O’Hare finished 2.7 degrees on the plus-side, ranking 3rd mildest. The rest of the Midwest through the Ohio Valley (especially along the I-70 corridor) followed suit, with 2017 finishing in the top four mildest years on record.